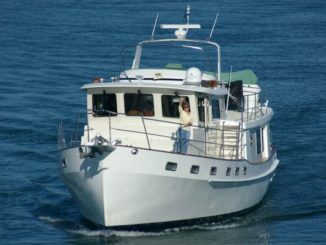 At the end of January 2016 we sold our much-loved 1981 40′ Ocean Alexander trawler, opting for what seemed an easier “aging-in-place” boat: a 44′ Navigator with level-entry swim step, cockpit and salon, and a pilothouse which is particularly handy in the not uncommonly cool, wet weather in which we boat in the Pacific Northwest and on the Inside Passage to Alaska. This boat is 21 years newer, but needed work in the engine room, so we’re spending two months doing low-to-semi-skilled projects ourselves, and hiring competent professionals to handle the list of skilled work beyond our abilities. Included in the list of projects for the pros was to replace all 8 lead-acid batteries, which could barely hold a charge for more than 30 minutes, all 8-15 years old! We anchor out a lot, so this was a non-starter. 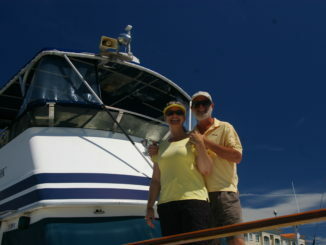 A day after the new batteries were installed, we arrived at the boat intending to spend 3 nights aboard. On opening the door to the salon we were assaulted by a strong odor, unfamiliar to us, but the closest description we could come up with was “a strong sewer smell.” In addition, a loud beeping noise emanated from somewhere. We followed the noise to the master stateroom where the carbon monoxide detector was found shrieking. We knew it wasn’t alerting us to carbon monoxide, because we know CO is odorless, so we were mystified. Nonetheless, we both started feeling dizzy within 4-5 minutes, so opened all the windows, ports and hatches, including the hatch to the engine room on the cockpit, then got off the boat fast to decide what to do. We called the guy who installed the batteries, got no answer, so left a voicemail message describing the issue and asking for a call-back. Then we Googled “what to do when CO detector goes off” and the advice was to call the Fire Department, which we were reluctant to do. 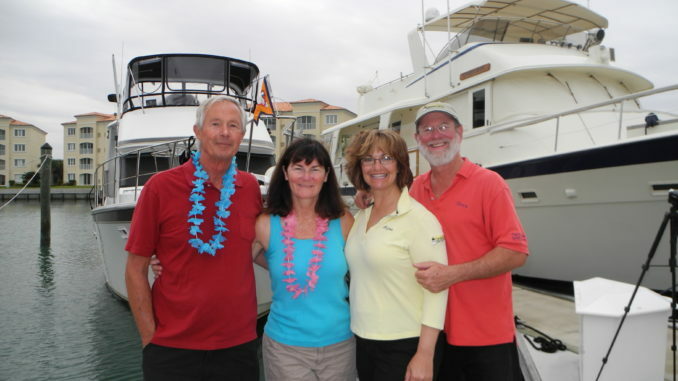 Still mystified as to other potential causes that set off a CO detector, we called Chris and Alyse and Caldwell of Captain Chris Yacht Services in Florida, a couple we’d hired in 2012 to provide us with 3 days’ training before we left for the Great Loop journey over the next 14 months. We’ve stayed in touch since then, and they’ve occasionally helped us through problems that stumped us. They answered this call and quickly peppered us with questions after hearing our description of the situation. While Cathryn talked on the phone, Captain Chris urged Bob to go into the engine room with his voltage meter and temperature gun and check each new battery. Cathryn, believing troubled batteries can sometimes catch on fire or explode, felt anxious but relayed this advice. Bob reported that all the batteries were ok with voltage between 12.4 and 12.6, except the double batteries servicing the stern thruster, registering 13.7 volts and very warm to the touch. Captain Chris advised us to immediately turn off the battery chargers and stay off the boat until the CO detector quit beeping and the battery was no longer warm. He explained that the battery or battery charger was defective, the batteries were being over-charged, and the smell was from hydrogen gas boiling off from the batteries. We asked if it would be safe to stay aboardthat night, and he said it would, as long as we left the battery charger off, the CO detector quit beeping, and the smell was completely dissipated. So that’s what happened. The battery installer called an hour later, concurred with Captain Chris’s advice, and arrived early the next morning to evaluate the situation and test the batteries and charger. He confirmed the problem and solution had been correctly diagnosed, and the old battery charger and both batteries were “toast” and needed to be replaced. So all is again well aboard the new-to-us boat. 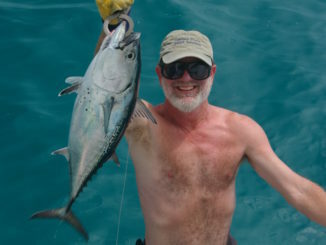 Cathryn emailed Jim Healy, whose articles, posts and responses to other people’s posts she’s been reading daily on both the MTOA forum and the Trawlers & Trawlering forum for the last six years. She was seeking the Guru’s confirmation that our experience was accurately diagnosed and resolved. Jim agreed with the advice we’d gotten in the moment, and the resolution, saying what happened is a very typical failure of a battery charger that results in the loss of the batteries. He said the smell we experienced was hydrogen gas from the batteries, and confirmed it will set off CO detectors. He also reassured Cathryn that batteries can crack open and get hot enough to cause smoke and charring, but “explosion” in the classical meaning of that word is unlikely. This helped alleviate Cathryn’sfeelings of guilt about sending Bob into the engine room to test the batteries. So, for those of you who are “typical cruiser/boaters”, as we think of ourselves: you know a lot, but there’s still more you don’t know, and you’re still learning. We hope this story provides some educational benefit, and that you never need it! We also hope we don’t come to be viewed as the “MTOA Masters of Disaster” who write articles regarding our latest problem twice a year. We’re the same couple who posted a lengthy story in the December 2015 Turtle Times about our “Terrible Day” July 2015 on the Inside Passage, in which Bob was badly burned from a ruptured engine coolant hose, we were rescued by the Canadian Coast Guard, and spent two weeks in the hospital. By way of an update, Bob is completely healed 7 months later and back to normal life. We considered getting out of boating altogether, rejected that option, and decided instead to sell the boat we had and buy a newer twin engine boat tocontinue cruising in the extremely remote territory of the Inside Passage during summer months. The new boat is named “Phoenix” in honor of our re-birth or recommitment to boating following the “baptism by fire” Bob got last summer. We’re happy and well, headed north in June for summer. For those of you coming west to the “Cruise to Nowhere” in September, we hope to meet you. And we don’t mean 55MPH although that would be FAST for paw-paw! Happy Birthday Chris!